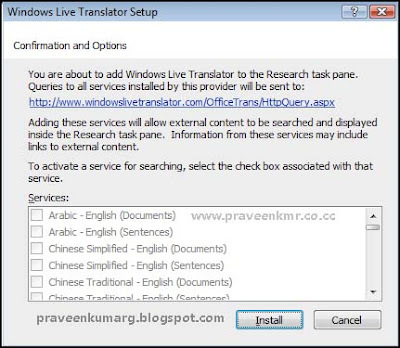 Microsoft made it easy to integrate what was then Windows Live Translator into the Office System.The Microsoft Translator Installer for Office went live on the Microsoft Download Center on April 6, 2009, and is now up for grabs. Microsoft Office Word 2003 and 2007. Microsoft Office PowerPoint 2003 and 2007. Microsoft Office OneNote 2003 and 2007. Microsoft Office Excel 2003 and 2007. Microsoft Office Publisher 2003 and 2007. Microsoft Office Visio 2003 and 2007. Microsoft Office Outlook 2003 and 2007.